Auto-Rigger and Reshaper is a tool for processing and rigging the 3D human body scans. 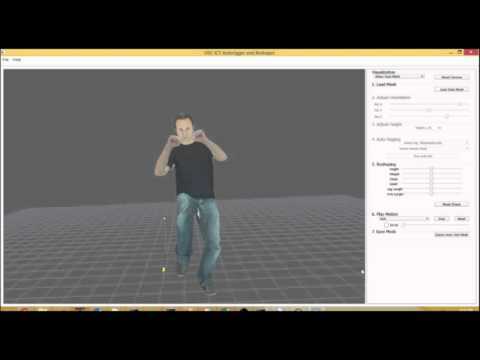 The user can import a 3D human model and use the tool to create a rigged model automatically. The reshaper utilizes a body shape database to let user deform the model based on shape parameters such as height, weight, etc. This tool is developed by Andrew Feng (feng@ict.usc.edu) and Ari Shapiro (shapiro@ict.usc.edu) at Character Animation and Simulation (CAS) group in Institute for Creative Technologies (ICT). You can download the Autorigger and Reshaper here. Drag-and-hold mouse LEFT Button to rotate the view. Use mouse Scroll Button to zoom in and out. Input the static scan mesh using “Load Scan Mesh” button. Adjust the orientation of the mesh with the orientation sliders to rotate the mesh into up-right position. Once the adjustments are complete, select the desired rig and gender of mesh scan. Click “Run Auto Rig” button. It would take around 30 seconds to complete the automatic rigging process. During the process, a template mesh would be adjusted to fit the scan. Once the rigging is complete, the skinning can be viewed by selecting “Show Scan Skin”. The body shape of rigged mesh can be adjusted using the sliders in Reshape group to change shape parameters (height, weight, and etc). To reset the shape parameters to default values, click “Reset Shape” button. To test the animated results for the rigged mesh, select a motion and click “Play” button. Finally, the resulting rigged mesh can be exported by clicking “Export Scan Skin Mesh” button. The mesh will be saved in Collada format (.dae). Noted that if you adjust the reshaping parameters in h., the reshaped mesh will be saved. Details of the Autorigger and Reshaper license are here.